We’d love your help. Let us know what’s wrong with this preview of Letters from Grace by Rachel Muller. Is loving a man in uniform worth the risk? Scarred from the death of her fiancé in World War II, Grace Campbell must learn to love again. Lieutenant Luke Brady could make falling in love easy…except he’s going to war. There’s one thing that can keep a thread tied between them—letters. But the suave Dr. William Keller enchants Grace with his charm and proposes marriage. She Is loving a man in uniform worth the risk? To ask other readers questions about Letters from Grace, please sign up. I don't often give low ratings, in fact I suspect that I'm overly generous with my stars. But in this case, I feel that two stars is just right. The book was OK.
Grace is a beautiful young woman along the lines of Grace Kelly and she's been grieving for her dead fiancé over two years now. She doesn't want to love another man in the army because she might lose him like she did Jack. And she smells like lilacs. How do heroines do it? It seems to seep naturally from some inner source through their p I don't often give low ratings, in fact I suspect that I'm overly generous with my stars. But in this case, I feel that two stars is just right. The book was OK.
Grace is a beautiful young woman along the lines of Grace Kelly and she's been grieving for her dead fiancé over two years now. She doesn't want to love another man in the army because she might lose him like she did Jack. And she smells like lilacs. How do heroines do it? It seems to seep naturally from some inner source through their pores, and I've yet to smell a flower perfume that doesn't make me think of old ladies. Maggie, she's energetic, full of the love of life and wants the best for her friend Grace. Namely to find a new boyfriend. She was very well meaning even when she didn't always say the right things. And thus, my favorite of the characters. Danny is Maggie's boyfriend and he's a daredevil, so he joins the air force and does many dangerous things with pleasure. I liked him, he was certainly different from the other characters. Luke has been mourning his mother for a year now, and you'd think his entire life was at an end. I'm not saying he shouldn't be upset, I like that he was close to his mother. But seriously, you'd think he'd lost his wife the way he acts. It just felt a bit weird. He sees Grace at a dance and falls instantly for her. I was hoping that later on we'd see what they saw in each other. Nope. Not unless you want to count the fact that she smells like lilacs and looks like Grace Kelly. "He couldn't help but stare. Her face resembled the flawless Grace Kelly in all her glamour." 8%, page 23. Oh, for pity's sake! That's not very imaginative. And what did she see in him? A dimple when he smiled. A letter once every few months from a man she'd seen twice telling her about how broken he was from losing his mother and faith, and that he remembered their dance. As she says "How did I fall in love with a man I hardly know, based on a series of letters?" 64% page 218. Gee, I don't know how you did either. Must be there wasn't anyone else for you two to fall for. Sometimes the way the characters talked reminded me of how my friends and I would play Barbies, we'd put the words in their mouths whether it was realistic or not. We picked whatever cheesy words would shock most or sound like how we though adults talked. So, I never felt close to the characters because they felt like Barbies/paper dolls or something. That brings me to the ending with the ex-boyfriend showing up to play the role of villain. It was so ridiculously far fetched that it completely spoiled the ending for me. After her fiancé died in World War II, Grace Campbell’s future is not bright and promising anymore. Her dreams were crushed along with her fiancé’s life. One day, though, she meets a handsome soldier that might bring new happiness to her shattered heart. Is falling for another soldier (and risking to lose the love of her life again) the right thing to do? I have to be honest and say that I expected something more. I am not saying that I did not enjoy this book, but I thought that some things wer After her fiancé died in World War II, Grace Campbell’s future is not bright and promising anymore. Her dreams were crushed along with her fiancé’s life. One day, though, she meets a handsome soldier that might bring new happiness to her shattered heart. Is falling for another soldier (and risking to lose the love of her life again) the right thing to do? I believe in love at first sight and I also believe that people can fall in love with each other through letters. But there must be something more other than the girl’s beautiful eyes and soft hair and the dimple in the right cheek of the guy! The letters that Grace and Luke exchanged added nothing more to what I already knew about them. There were no references to their past (aside from some sad memories about Grace’s fiancé and Luke’s mother), they never shared anything about how their life was before they met (and by this I mean simple things like what they loved to do, what their values were, you know real things to get to know each other) and yet they fall in love after like two letters!? He does not know anything about her or her personality (because in their letters they talk about the war and how dreadful that time period is) and yet he falls deeply for her? Either I know nothing about love (and that is likely) or there is something wrong with this story. While I was reading this book I kept thinking that their love was not true. It was like they had to be together because they had nobody else in their life. Grace was so confused that she even encouraged another man because she did not want to fall for Luke (as if one could control their heart! Love just happens!) And Luke was so afraid to be alone that it was like he loved Grace because he felt abandoned by everybody after his mother’s death, as if he had to find a girl to share his life with at all costs. The only thing I liked was the relationship between Maggie and Danny, the protagonists’ best friends. Though I had a feeling Maggie was not that involved in that relationship as much as Danny was (and I was right! ), I thought they were cute and endearing. In fact, I might pick up the second book in this series just to see if Maggie gets her own happy ending! Something tells me she will find her true love! So, basically, the reason why I did not like “Letters from Grace” as much as I thought I would was because I never believed that the protagonists were really in love with each other, and there is an event that occurs right before the end that confirms my opinion (view spoiler)[she accepts to marry a man she does not love, that she had already refused once, two minutes after he tells her that Luke has died! Where did the deep love she had said she had for Luke go!? (hide spoiler)]. They cared for each other, they were worried about each other, but love is different. You do not love a girl just because she wears a lilac perfume that, for some strange reason, you cannot get enough of and because she looks like Grace Kelly. And you do not love a man because he has a wonderful smile and broad shoulder. There has to be something more. Maybe I did not understand Grace and Luke’s feelings? Despite my negative opinion, some readers might appreciate this novel. The religious message is very strong and important so maybe Christian Fiction readers might enjoy this book, but be prepared for quite a depressing plot! I loved this book. I read it in one setting because I could not put it down. I was pulled into the characters and their stories from the very first pages. The writer does an extraordinary job of transporting the reader back the time of WWII and the battle scenes are so real you feel like you are a first hand observer. It is a beautiful story of lost love and love found. I wholeheartedly recommend this book and will be looking forward to Book 2 in the series. Very good book. Start reading and today's world fades away as you find yourself back during WWII times. The characters are vivid, and you find yourself feeling their ups and downs as though you are living it yourself. Love the historical references. Definitely worth reading, can't wait for the next book! In her debut novel, author Rachel Muller shows us that she has what it takes to write a great historical fiction novel! Having done her research well, Muller gives us the picture of life during WW II. I had a tough time putting down this page turner. With well-developed characters that pull the reader in, I loved Grace and Luke’s story. With trust in God as the underlying theme, all the feelings are there; heart ache, fear, helplessness, and yes, love. The war scenes are well written and very dra In her debut novel, author Rachel Muller shows us that she has what it takes to write a great historical fiction novel! Having done her research well, Muller gives us the picture of life during WW II. I had a tough time putting down this page turner. With well-developed characters that pull the reader in, I loved Grace and Luke’s story. With trust in God as the underlying theme, all the feelings are there; heart ache, fear, helplessness, and yes, love. The war scenes are well written and very dramatic. I’m looking forward to reading Book 2! I received a complimentary copy of this book but was not required to leave a review. If you are a fan of World War II fiction and romance, this is the perfect novel for you. Rachel Muller's tale of the fear and uncertainty of war and love is gripping and heartwarming--a story of resilient people living in a world torn by brokenness. Even so, there is beauty, hope, and love to be found. This is a wonderfully told story by a talented storyteller. As World War Two comes to its climax, two people discover the meaning of loving and letting go during a time when far too many hearts were broken by the ravages of war. World War Two continues to fascinate historians and readers alike for a plethora of reasons. People love hearing about the triumphs of those who were a part of the Greatest Generation. The drama, romance, and bravery of those who fought for freedom across the Atlantic and Pacific Oceans are compelling on their own…bring in a tale As World War Two comes to its climax, two people discover the meaning of loving and letting go during a time when far too many hearts were broken by the ravages of war. World War Two continues to fascinate historians and readers alike for a plethora of reasons. People love hearing about the triumphs of those who were a part of the Greatest Generation. The drama, romance, and bravery of those who fought for freedom across the Atlantic and Pacific Oceans are compelling on their own…bring in a talented author whose sincere love of the time period shines through the pages and the stories just come to life. Debut author Rachel Muller has been obsessed with World War Two since she was a teenager. Her love for this period is obvious in the multiple stories that make up Letters from Grace; her exquisite writing and attention to detail accentuate the gift she has for combing her passion with her talent. Letters from Grace is a novel that all readers will enjoy—World War Two aficionado or otherwise—because Muller knows how to pen a tale with exciting storylines and believable characters that bring the Greatest Generation to life. Luke and Grace are in their twenties when World War Two begins—young enough to feel the excitement of love but old enough to know the heartbreak of war and death. Both of Muller’s protagonists fear the pain of opening up their hearts to love after they experience devastating losses in the early 1940s. Grace struggles to move past her loss and never loses her faith in God, despite a rapidly changing future with no concrete answers. Luke, meanwhile, falls prey to the pull of darkness and gives up all hope that his loving God has a plan for him. Grace and Luke’s friendship develops over the series of letters that helps keep him sane as he prepares for the crucial battle in the war—a battle that could bring freedom to many people but also the risk of death, injury, and more broken hearts. Months and many letters later, Grace and Luke have to decide if they will put their potential relationship in the hands of God or leave fate—and one disastrous war—to decide the future for them. Readers of World War Two fiction have numerous extraordinary authors to choose from for their chosen genre of books. Sarah Sundin, Tricia Goyer, Cara Putnam, and Kristina McMorris all have penned tales of love, loss, and war during the 1940s. Some potential authors could be intimidated by the success rate of these authors—how could a new author begin to compete with these ladies’ novels? Not Rachel Muller! She’s written a story just as beautiful and compelling as any other author of World War Two fiction has come out and, if the early posted five-star reviews are any indication, she will rapidly join the ranks of her contemporaries. Letters from Grace is told from third-person point-of-view that alternates primarily between Grace and Luke but occasionally brings in their two best friends, Maggie and Danny. These alterations allow readers to experience the war and home-front from many angles. Each character is lively and fully developed in ways that challenge readers to understand the perspectives of the various people who fought at home and across the seas. Grace, devoted to her work at the Ladies and Liberty and grieving for love; Maggie, cheerful and driven to bring God to sick and wounded soldiers on the front lines; Luke, lost over his absent family and finding solace in the Army; and Danny, love-stricken and determined to come home from the war a hero. 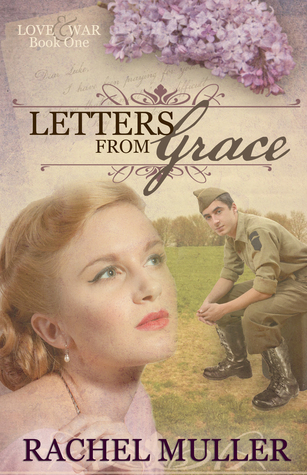 Each storyline brings to life different struggles that were unique to the Greatest Generation; however, the emotions that Muller shows from her characters are so well written that the happiness, sadness, and desperation are easily felt when reading Letters from Grace. I found the friendship between Luke and Danny and Maggie and Grace honest and open. The love these characters had for each other and showed to those around them exquisitely exemplifies why those who lived during World War Two are known as the Greatest Generation. An avid reader of World War Two historicals, I jumped at the chance to review Letters from Grace because I never pass an opportunity to read another story set in my favorite time period. As a bonus to my already excited disposition at finding this new novel, I knew that if authors Sarah Sundin and Cara Putnam were assisting Muller with her book that Letters from Grace was bound to be an excellent story. My assumption was correct—a five-star novel from a debut author, readers of World War Two fiction will have a new favorite author to add to the already stellar collection of those who tell stories of the Greatest Generation. From the gorgeous cover, to the thick binding and paper, to the historical details and symbolism front and back, Letters from Grace is just as beautiful on the outside and its story comprises the inside. This novel is one to keep on your shelves for re-reading and display purposes. It is in all truth that I say I looked immediately to the back of the back for information on future novels from Muller. Without even reading the story, I smiled widely upon finding the release date for Maggie’s Mission. January 2015 can’t come soon enough! From the cover to the last page, a lovely story.
" Letters From Grace" by Rachel Muller is the 1st book in the (Love and War) series. This book had me experiencing the characters's happiness and sadness while reading. The covers for this series are just beautiful. Oh my Oh my reading "Letters from Grace" by Rachel D. Muller, this book is about war and I want to cry! But it silly isn't it, these characters aren't real ? RIGHT. This was a Facebook post that I posted while reading this book. This book has sad parts and yes it is a fiction but it " Letters From Grace" by Rachel Muller is the 1st book in the (Love and War) series. This book had me experiencing the characters's happiness and sadness while reading. Oh my Oh my reading "Letters from Grace" by Rachel D. Muller, this book is about war and I want to cry! But it silly isn't it, these characters aren't real ? RIGHT. This was a Facebook post that I posted while reading this book. This book has sad parts and yes it is a fiction but it is written like this was actually taking place. I think "Letters From Grace" would make an excellent Hallmark movie. I encourage you to read "Letters From Grace" and you too will actually think you are watching Grace and Luke dance and you will be wanting to turn the pages to see if they received a letter that day and what was happening while Luke was on the warfront and Grace was delivering supplies to war victims in hospitals. Instead of working on my essays for work, I am sneaking off to write a review...To be honest, this is the first Christian romance fiction I have read to the end. There are others I have started and haven’t gotten around to finishing, and some I just haven’t touched yet—but back to the point. I am glad Rachel’s book was my first. I’ll list some of my issues with the story first, but as a whole, I enjoyed the book. I am not a religious person, so there were some moments in the story that I felt we Instead of working on my essays for work, I am sneaking off to write a review...To be honest, this is the first Christian romance fiction I have read to the end. There are others I have started and haven’t gotten around to finishing, and some I just haven’t touched yet—but back to the point. I am glad Rachel’s book was my first. I’ll list some of my issues with the story first, but as a whole, I enjoyed the book. I am not a religious person, so there were some moments in the story that I felt were too much for me, such as when one of the character feels bad for turning to alcohol to numb away pain. It felt a bit over the top for me, but I understand at the same time, granted it’s a Christian fiction after all. Another issue I had was with the character of the doctor. I wanted to know what it was that motivated him to do what he did and why he was so adamant about his affections. Maybe it is as simple as it is, but his action towards the end kind of blindsided me. Something just felt off about it. But other than that, I thoroughly enjoyed the story. First of all I would like to say that I congratulate Rachel Muller for making the decision to go Indie! We live in an ever-changing world and the literature we love has to be able to flow and change with that world... and only the best writers know just how essential it is to be flexible! Rachel Muller has written the novel of her heart. I know how that feels and I even feel as if I've been on part of this adventure with her. I've watched as she blogged and hinted at the contents of this novel. I' First of all I would like to say that I congratulate Rachel Muller for making the decision to go Indie! I've watched as she blogged and hinted at the contents of this novel. I've read posts about her journey as an author and I applauded her decision to go Indie when the circumstances were not precisely what she wanted for her work. Maybe authors today are making the choice to become independent because they want more control over their own work. They want to be the one who makes the tough decisions and I find that incredibly brave! To read this work is to be transported to our own little piece of history. Rachel did an incredible job researching her favorite period in history. I know I've enjoyed reading about where that research has taken her. Letters From Grace is the first book in what is meant to be a series and I'm excited to see what is coming next! Fair warning: this book is not for the faint of heart. The subject matter touches on one of the most difficult times in our country's history and, though it does that very well, it is a difficult period to read about for many people. The important part is that Rachel brings us this story, pulling us into a time long gone - reminding us why it is important to remember, why it is important to teach our children to remember. I don't know about you but I was never all that interested in history. If only all the events in history were put into novel form... I know I would enjoy it a lot more! This story touched my heart in a special way. The author takes the reader on a journey of love, heartbreak and renewal of faith and trust. As Grace mourns a major loss in her life, she continues to try to help others. Something as simple as writing letters to a soldier helps begin the process of grieving and finding love once again. This is a story that will stay with me. The author gives great details and insight to war time. I look forward to reading more from this author. I have a new favorite author of historical books! Until I read Letters From Grace, the only historical book I remember reading was one I was asked to review The Christmas Star by Ace Collins. It was a good story, but I wasn’t hooked. Now I’m wondering why I wasn’t hooked previously. No matter… I’m hooked now! Rachel Muller wrote an AMAZING novel! My family will attest that I spend way too much time ignoring them over the holidays, while I was reading Rachel’s debut novel — about Grace, Maggie, Danny I have a new favorite author of historical books! My family will attest that I spend way too much time ignoring them over the holidays, while I was reading Rachel’s debut novel — about Grace, Maggie, Danny and Luke. I congratulate Rachel for making the decision to go Indie! I’ve read posts about her journey as an author — how she became obsessed with the World War II time period and I applaud her choice to go Indie when the circumstances were not precisely what she wanted for her work. I’m glad she saw how awesome her novel is and decided it was time to share it with all the readers of historical fiction. I believe her novel will reach many, many people! This book is not easy to read… I wasn’t prepared to read about the horror of war; this subject matter touches on one of the most difficult times in our country’s history! The characters are very believable, the language is perfect for the time period, and if you read this novel, you will be pulled into the 1940’s almost immediately! I really felt like I was there. I could see it… hear it… smell it. Wow, Rachel has woven a story with characters that will capture your heart. I was caught up in the lives of the characters as they lived with so much uncertainty during World War II. We get a glimpse into the hearts of Grace Campbell and Lieutenant Luke Brady as they exchange letters while he is off fighting in the war. Of course, as with any relationship, things don't always go as planned. Dr. William Keller also shows an interest in Grace. Grace must decide between following her heart or a much safer path. While awaiting for God's guidance, unexpected events unfold sending Grace searching for her heart's choice. But deception and lies meet her instead. If I could I would rate this novel a 10! Rachel Muller, for this being the first historical novel, you have done an exceptional job! I've read many historical novels, and books in general; very few are the quality of this novel. The story's (she has given each of the main characters a story line as she ties them all together) are so authentic and well written, there were many times that I became involved and engrossed in the story line that I would loose track of time. There were a few places where I even reacted to the story by crying out. This is a wonderful novel, this will go down as one of my favorite novels. The attention to details of that era is remarkable. Right down to the White gloves we used to have to wear when in public. However, the testimony of God's love, grace and mercy is remarkable! The reality that we all lose our way or get mad at God is so very real. The response and guidance from the Bible and Christian counsel is very admirable and spot on! It is these human moments and emotions that add greatness to this novel! This story is warm and comfortable and reflects life in a fair and accurate and meaningful way. The characters are genuine and the story flows smoothly. Muller openly admits that she drifted from total historical accuracy in order to make the story about the characters and NOT about the war. That being said, her book is well worth reading. The struggles her characters face are common to us all, which helped me to identify with them as if they were real people. Rachel offers wise advice in her stor This story is warm and comfortable and reflects life in a fair and accurate and meaningful way. The characters are genuine and the story flows smoothly. Muller openly admits that she drifted from total historical accuracy in order to make the story about the characters and NOT about the war. That being said, her book is well worth reading. Rachel offers wise advice in her story that's applicable to our lives today. This is a story that explores not only fear, but loss and regret as well. Her action scenes from the D Day attack were well written and suspenseful. Bear in mind her action sequences were not designed to entertain, but to point back to the relationships between the characters. Muller is able to explore vulnerability in a way I have not before encountered, and I appreciated her take on the subject. I love correspondence books. SO when this came up free on Amazon, I *HAD* to have it. 1. It's a chrischun book. Meaning it talks about Jee-zus and quotes verses, but out of context and with a silver-lining viewpoint. For example, she lies and says 'God never is silent'. Um... yes, He does use silences and 'desert'-periods to reach people. It was warm n' fuzzy, at best. 2. I had a hard time connecting to the characters. They didn't communicate enough to really have a good base for their 'love'. 3. T I love correspondence books. SO when this came up free on Amazon, I *HAD* to have it. 3. The communication was... not well done. In the middle of an 'I love you' will be an 'I desperately miss my mom' with no transition from one to the other. Once I started reading this book it was hard to put down. This story is set during WWII. Grace had lost her love to the war and was scare to get involved with another solider. She meets Luke at a dance that she attended with her friend Maggie. He is getting ready to leave for England and ask her to write him so she agrees to. The characters were so real, I am so glad there is more in this series, I cannot wait to read more. On a scale of cotton candy to Brussels sprouts, Letters from Grace by Rachel Muller is a cinnamon sweet roll. The story was sweet with the sizzle of cinnamon. Grace is a lovely character with such a choice before her and more heartbreak than one person should deal with. And I maybe fell in love with Luke Brady. Shhhhhh. Don't tell anyone. I loved the history. The story came alive for me. This was a really good story. As I was reading this I felt like I was watching an old World War ll black and white movie and I kept thinking about movies like Mrs. Miniver and The Best Years of Our Lives, some of my favorite movies. This novel has a fast paced and truly captivating story. It gives a glimpse of life during a war and uncertain times while pointing to the only true source of comfort and peace... Jesus Christ. Intense of being a young woman on D-Day! This story is about the young people who endured love and loss of WWII. A read that should be read. I could not put this book down. I,m going to start on the second book now. I would like to know when the third book will be available.